And then there is Indy. 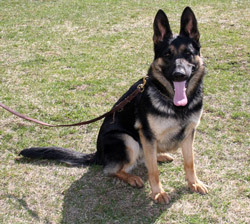 Indy is out of Strongheart (V Imo Vom Werraufer Sch III, FH) and Bree (Bree Zum Alten Hof CD) of our I litter, May 2007. She has it all: intense drives, full grips, and with victory: calm.